One of the things I have signed up for is a Take It Further Challenge run by Sharon B. at In a Minute Ago. Last year I enjoyed following her Take a Stitch Tuesdays, where she posted a different embroidery stitch each Tuesday and showed how to use it. I never did any of these stitches myself, mind you, but I enjoyed seeing her do it. This year I thought I'd get more involved. Her challenge this year is to take a concept each month and Take It Further. There is a second option each month of a color scheme that can be Taken Further. The concept for January is Admiration, and the color scheme is what I would call muted greens and purples...that lean towards mauve and avocado. I have been really struggling with this! The people I admire are the ones who can easily and effectively deal with other people. I admire teachers. I admire people you can depend on. I admire the artists that have given me their time and knowledge so I can become more skilled. I admire my husband, who is college professor and director of a high tech research lab. How the heck can I put this feeling into my art? Here is what I have come up with so far. Maybe I will print it out onto fabric and stitch highlights in the challenge color scheme. 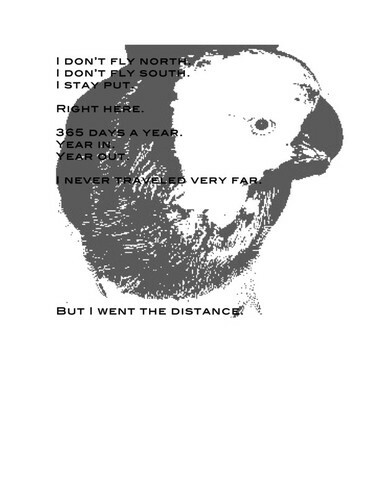 And just in case you are wondering about why a parrot is involved in this concept... parrots don't migrate. They usually live in areas that have food available year round. So, instead of remembering how to fly long routes, they remember where the currently ripening food is. And they tend to live in big noisy social groups. Well, remember I am nuts about birds, so this makes sense to me. This would be beautiful embroidered with the theme colors leaving much of the black and white also. I think it fits just fine. Thank you for the parrot imagery, and new knowledge. I have felt solid, in a good way, and used tree imagery before, but I am getting bored and need a new angle. Plus, there are some negative connotations along with the positive one - rooted can be stuck, strong can be rigid or unyielding. I think I get to do some research on parrots. Thank you! I love birds of all kinds too but never knew this about parrots! It will be interesting to see what you do with this in the end. I struggled with the concept of how to apply the feeling of admiration in an art project. You succeeded beautifully at the task. Thank you for sharing your work.